The Insert-type brushes have been enhanced with a new ability to insert copies of one mesh between two “end cap” meshes. For example, you can with a single stroke create a chain where its links are duplicated between two locks or stoppers. The TriParts feature is based on three PolyGroups. The top PolyGroup will be the start of the curve, the middle PolyGroup will be duplicated along the length of the curve, and the last PolyGroup will be at the end of the curve. You first need a specific mesh, composed of three PolyGroups. As mentioned above, these groups define the end caps and duplicated portions of the curve stroke. Remember: The view of the mesh relative to the camera plane will determine how the origin of the mesh will be drawn onto your model. Enable Curve mode in the Stoke palette and change the Curves settings as desired. In the Brush >> Modifiers sub-palette, enable the Tri Parts mode. 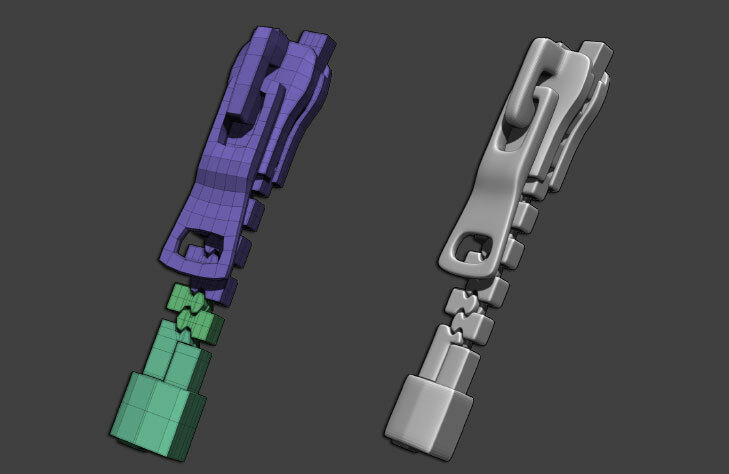 This instructs ZBrush to replicate the middle PolyGroup between the other two PolyGroups. Depending on your needs, adjust the other options: Soft Curve, Curve resolution and Twist to Turn. Create your object along the Y axis, oriented on the X/Y working plane. Try to create each part (the end caps and the duplicated portion) with the same height. Failing to do so may not result in clean duplication along the curve. Use the Tool >> Deformations >> Unify command to create a mesh which will be one ZBrush unit in size, with a centered pivot point. The Draw Size value will define the size of the inserted items. As with the other curve brushes, enabling Bend allows the curve to be edited. Note: When using the TriParts technique it’s crucial to make sure that the vertical height of all three PolyGroups are relatively the same.